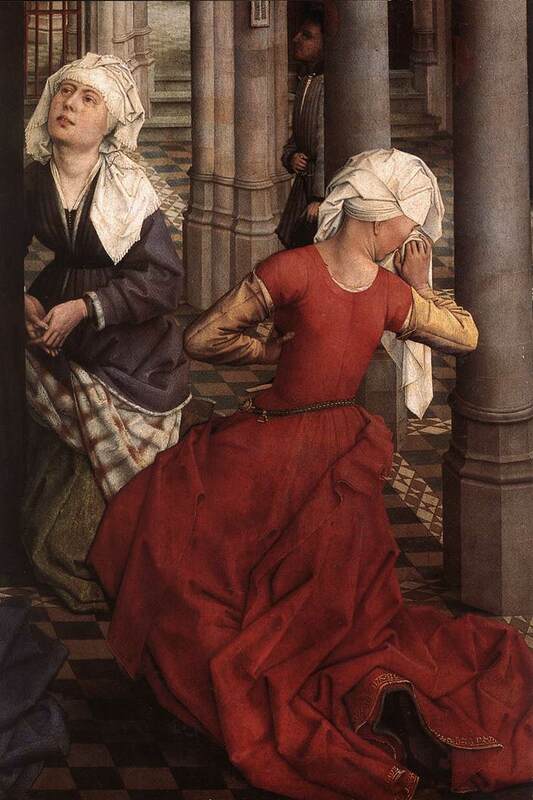 Rogier van der Weyden is a splendid resource for many wonderful gowns of the 15th century - and gives really good hints on how something is set together. This really nice example is from the Abegg-Stiftung in Riggisberg-Switzerland. The Colors are too dark on the picture - but Alas - it is all the WGA had. The Abeggstiftung is closed in Winter - thats why I can't get another picture. But I do have some sketches from last autumns visit. On the sketches a side lacing trough lacing holes is visible - the only other closing I know from Mijnheer van der Weyden is the front closing of the Magdalena from the Brague Tryptich. The sketch shows latter lacing! As well as a nice wee purse! This picture of a reading Magdalena shows on her decollté a lacing - probably of the dress worn under the robe? But I do love her coif as well!! !